Businesses are designed to be stable – shareholders want predictable growth and returns. However for a bussiness to catch the next big wave this is counter to stability. To internally grow a new bussiness it is likely to result in a reduction of the current results. To facilitate the growth of a new bussiness line extreme care needs to be taken to prevent innovation stagnation or from competition from other companies. The book presents four zones. When a new fledgling bussiness comes along it is critical that this becomes the number one priority. It has to scale to >10% within a maximum of 3 years else it will be suffocated by the other bussiness lines. This means hitting targets is now the second priority as failing to scale the new bussiness line will mean that you will have missed the opportunity and all of the work to get it to this stage will have been wasted, additionally this bring on of a new bussiness line is a temporary upheaval which should return higher profits in the future. The first principle of zone defence is that you must never attempt to disrupt yourself. As an established enterprise, your number-one asset is the inertial momentum of your installed customer base. Your number-two asset is an ecosystem of partners that makes its living adding value to your established offerings. “Successful disruptions disrupt other companies’ bussiness, not their own.” If you are being attacked your target should be to neutralise the opposition (e.g. taxi firms using ride haling apps to counter Uber). These neutralisation assets could come from work you are doing in the incubation zone. Source of revenue vs channel of revenue. Each cell must be accounted for, not just the rows and columns. The rows must be >10% of the revenue to be taken seriously. As such only things in the performance zone are present here. Regulatory compliance – Culture, values and tone set the direction of compliance with oversight, detection and remediation to correct. You have to design compliance in and monitor it vigilantly. When budgeting these functions should be separate from the budget for other bussiness units since all other zones use their function – each bussiness unit should not need to estimate how much of the shared service they will use. One key thing in this zone is to consider the end of life of bussiness units when it would be better to use the internal resource on something which brings the company more value. The best way is to have an end of life shared service since killing products is a specialist task. This is the place for ideas which are several years out. The ideas in the incubation zone should not be incremental of what you have currently (this is for the performance zone), these are for things which could grow into being their own credible disruptive innovation delivering billions of dollars of revenue within a decade. In the incubation zone it should build a highly competitive product into a bussiness with between 1-2% of the companies revenue, so this needs the best people. These are businesses in their own rights with specialist sales, marketing and competitive services to compete against other startups. The businesses in this zone are overseen by a venture board, here they decide on investment into independent operating units. Each unit is run the same way as a startup with venture-funding and milestones. 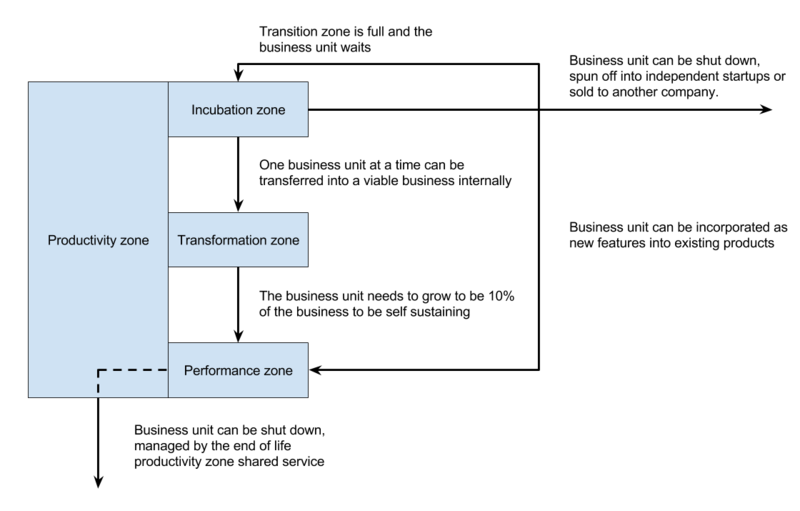 Space in the incubation zone is limited so if a unit fails its technology should be assimilated into existing products and the team moved on. Successful units then have the option to move to the transition zone, if it is not already occupied, the technology could be introduced into an existing line of products, the unit could be spun off as a start up, sold (though seeking buyers might be a distraction) or shut down. When bringing on a new bussiness unit into the main bussiness it will cause problems for your existing bussiness. As an example your sales teams don’t have the contacts to sell these products. Things in the transformation zone will under-deliver in the short term, but the aim of this is long term gain and bussiness stability. The majority of the time the transformation zone is empty, a bussiness can not cope with such huge change very often. The most important thing to do is to complete the transformation than to make the current numbers – the growth of this bussiness unit is the businesses future, not its present. A company can only undertake one transformation at a time, taking on two at the same time will be too much for the company to bare. For the transformation to be successful every leader in the company must be aligned with the transformation. From the moment a unit enters the transformation zone until it gets to 10% of revenue it will be a very destabilising forces within the company – above 10% it starts to stand on its own.